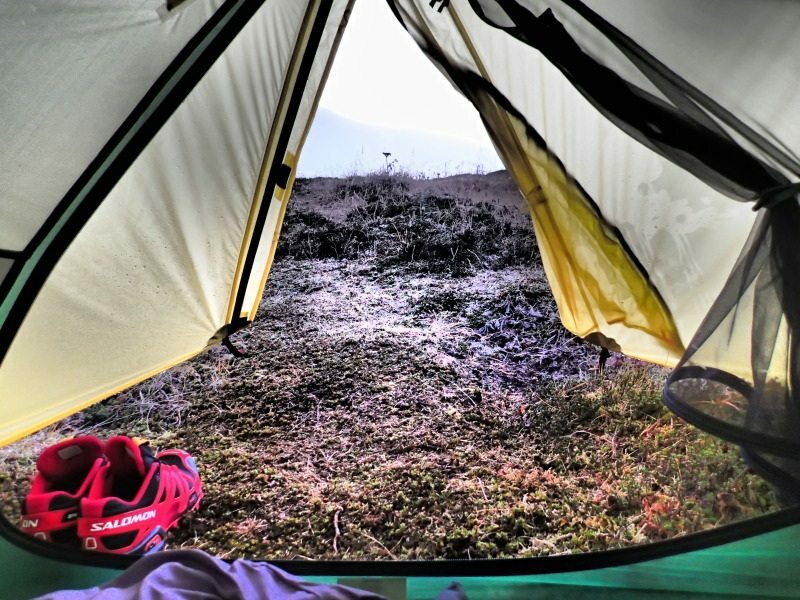 Kodiak Island is the perfect proving ground for nearly all outdoor gear. If an item can withstand the rain, wind and cold on Kodiak then it should work anywhere! 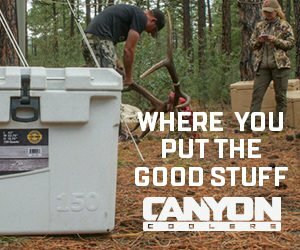 As a general rule I don’t take new unproven gear to the field with me, especially on fly out hunts to Kodiak, so I brought some “back up” shelters in case we needed them. This proved to be unnecessary, as the Foray worked flawlessly! Brooks Range is a high end gear company known for creating high quality mountaineering equipment that is suited for challenging weather, while still managing to keep the weight of their products low. 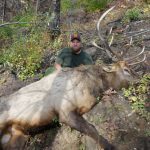 We were going to Kodiak for a mountain goat hunt where we might potentially have to spike out several miles from our drop off location to get on the goats, so every pound counted! 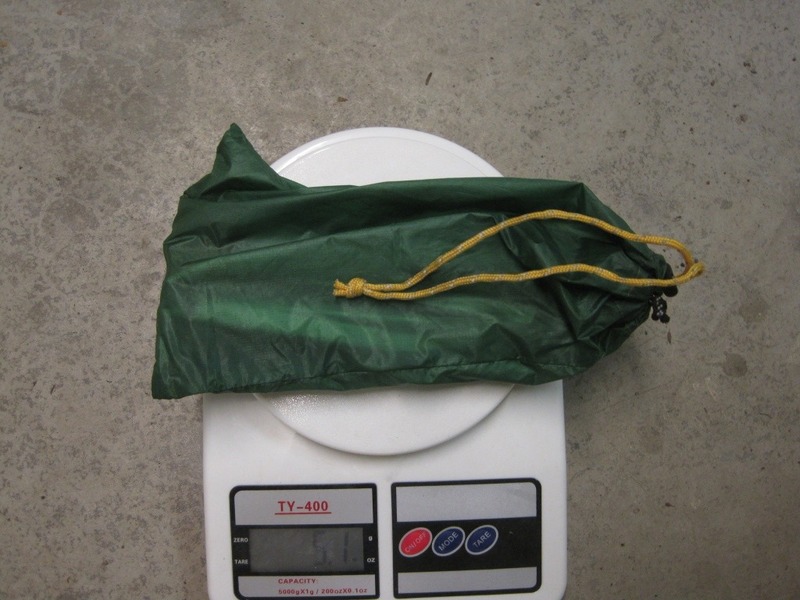 One surprising thing I noticed when I weighed everything (tent, fly, stakes, guy-lines, instructions, poles, and all associated stuff sacks) was that the total weight came in at 47.3 oz or 2 pounds 15 oz for a max weight, rather than the listed 3 pounds 2 oz. So often in the backpacking world manufacturers fudge their weights to sell a product. 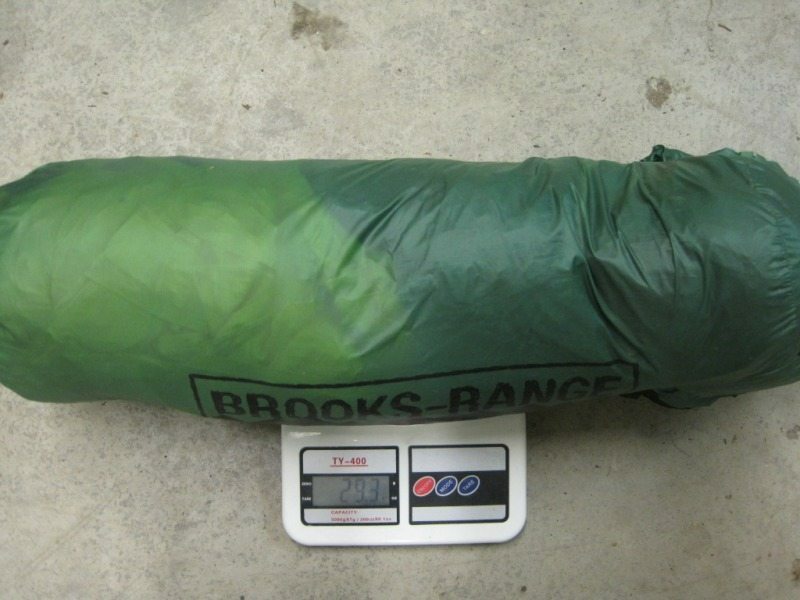 It was refreshing to see that Brooks Range actually listed their tent 3 oz heavier than what I weight it to be. During the initial setup in the field it was sprinkling (which seems to be the norm for the island), so setting up the tent quickly was a priority. I was pleasantly surprised with how fast the tent went up, even having never done it before. I believe this is attributed to the ingenious single pole design of the Foray. In a matter of 2-3 minutes out of the bag, we were beginning to clip on the fly. Brooks Range provides all the stakes, guy lines, and tensioners needed to guy out all the mid height guy outs, as well as all the staking points on the bottom of the tent. An added bonus is that the instructions for set up are printed on a tag that is attached to the tent’s sack, so you never have to worry about losing them. Since we were taking a 3 season tent to an area with no protection, and on an island known for wind, I opted to replace the stakes with heavier MSR ground hog stakes to hedge my bets and better give the tent a grip on the ground. 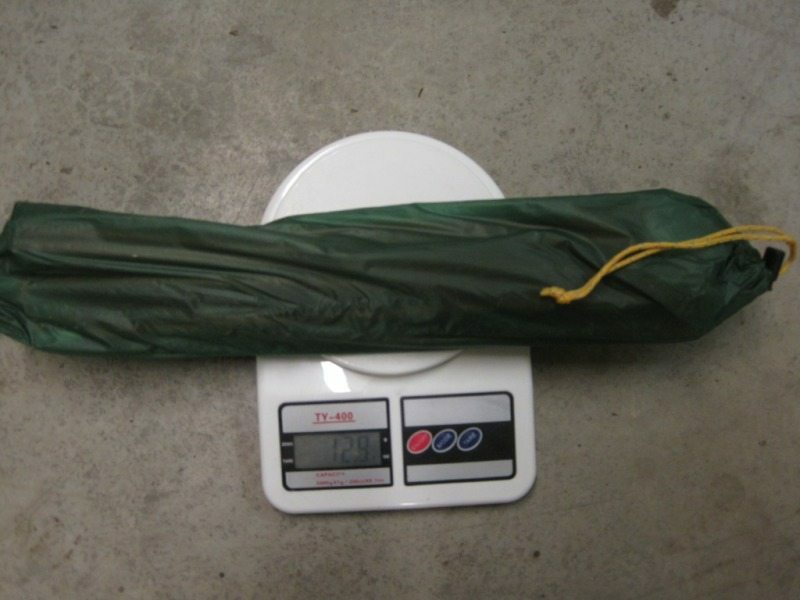 This was a bit of extra weight, 5 ounces, but being as I was heading to Kodiak with an unproven tent I figured it would help mitigate some of the unknowns. 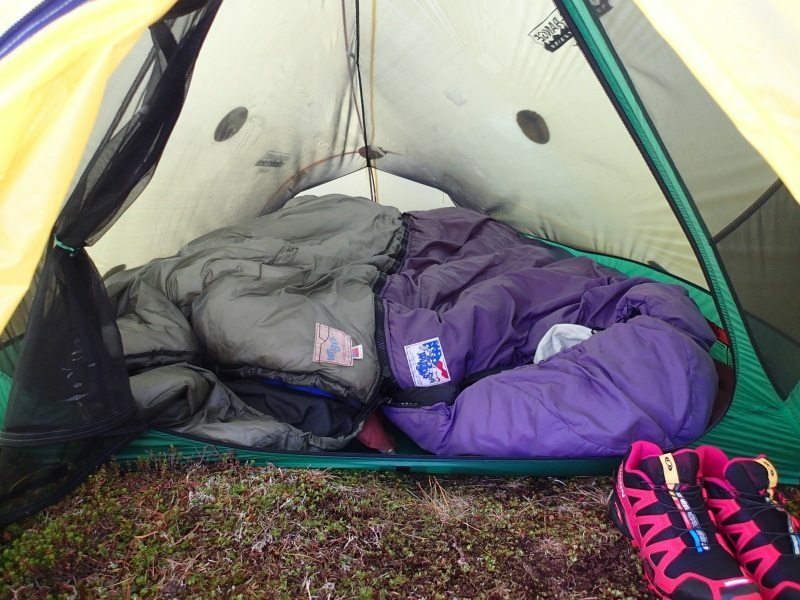 After airing up the pads and throwing the sleeping bags in, it was apparent that the tent would be “cozy” for two guys. However, I was with my wife so that didn’t matter much. We slept comfortably in the Foray every night of our trip. The vestibule, while not huge, is very functional. We were easily able to sit up and take our boots on and off in the vestibule without having to sit outside or open up the door, which is nice when it’s blowing and pouring down rain. One of the best features of the tent is the angle of the door. In most tents the door is angled in such a manner that the bottom of the door sticks further out than the top of the door. Companies do this so the floor dimensions appear larger than what is actually usable. Brooks Range chose to forgo “appearing larger” on paper and just went with actually usable dimensions in their floor, while still enabling you to sit in the inner tent portion of the shelter with your feet in the vestibule to don and doff your footwear. This design also puts your head in the peak height in this position, making it easier to cook meals and other tasks inside the shelter when the weather is sub-par outside, without having to crouch as you might in other tents of the same weight category. A final perk of the bottom of the inner tent door being angled back away from the door on the fly is that it allows all the water that might drip off the fly when you are entering and exiting the tent to drip into the vestibule floor rather that inside the tent itself where your bags and pads are. This is a problem so many other tent manufacturers have over looked and seem to not be willing to rectify. 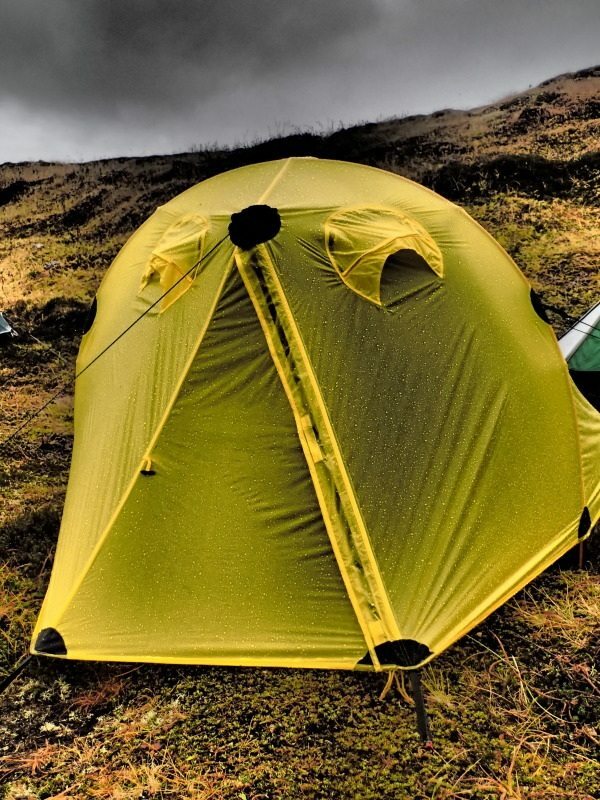 We had 6 days of continuous rain on Kodiak, and the factory seam sealing that came with the tent held up extremely well without so much as a drop making it inside. Also, the Foray comes with excellent ventilation capabilities, which makes managing condensation in even the wettest or most humid condition simple. The vents are located above the door and can easily be zipped open and closed to provide adequate ventilation, even in 100% humidity situations for days on end. Luckily we didn’t have much opportunity to test how well the Foray holds up to extreme wind, but it handled the 30 mph sustained winds we had the one night with ease, and was surprisingly quiet in the wind due to the tents tight pitch. 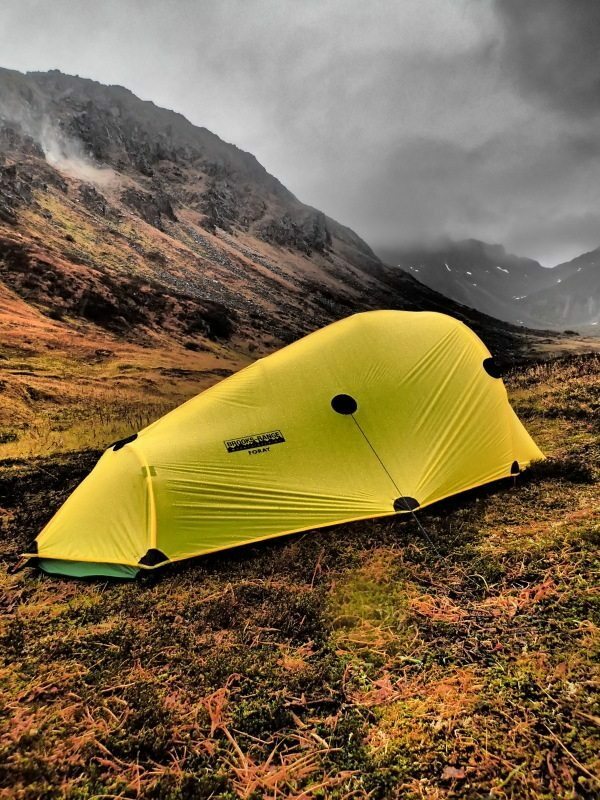 I have used other lightweight two person tents like the Big Agnes Seedhouse SL2 and Flycreek 2 and can say for a fact that they are much noisier and not as stout in such winds. I believe this is due to a much more robust pole design in the Foray for a three season tent, as compared to other tents in this weight class. The tensioners on four corners of the fly also accounts for the taut pitch and can be adjusted as needed with ease. Overall, I am very impressed with how many useful features Brooks Range was able to squeeze into the tent given it’s minimal weight. This is not a tent I’d opt to spend 10 days in as my only shelter with another guy on a fly out hunt, but as a spike out tent for 2 guys for a few days or a solo shelter it appears to be just the ticket.